The Gurugram-based travel and hotel e-commerce website ixigo has picked up a lot of traction over the last few years. Founded in 2007, the company already boasts of a user base of over 100 million travellers. In fact, they are now looking to expand their team & R&D efforts and are in talks with investors to raise another $75 million for their series C round. Analytics India Magazine got in touch with Rajnish Kumar, CTO and co-founder of ixigo, who said that the idea of founding the company was born out of their uncomfortable experiences as travellers. “We felt that though there were plenty of travel sellers online, there were not enough websites or apps who were solving real problems that travellers faced,” he said. Since then they have been helping travellers plan their trips with better information, let them compare and book the best and help manage their trips — for which artificial intelligence and big data plays a crucial role. While the travel industry has witnessed some interesting disruptive technologies in the last couple of years, AI and predictive intelligence have been revolutionising the space like never before. 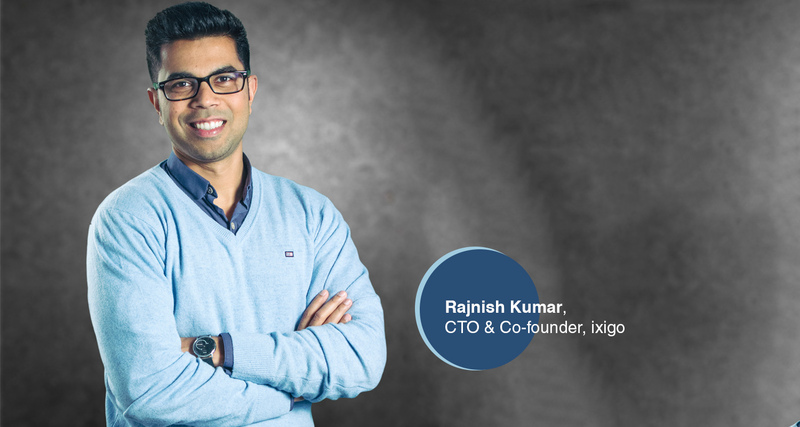 “This is something that we have been at the forefront of iterating in our product offerings at ixigo,” shared Kumar. The company has had an interesting journey from being a metasearch engine to evolving into a travel marketplace. Their first step was to pivot their entire thinking as a company to mobile-first. The other big shift that Kumar believes they took was to bet on artificial intelligence, machine learning and voice. “As a meta platform, our biggest advantage versus online travel agencies was our product and tech intensity. We took bold bets on building a research team that worked on AI and data-driven predictive use cases such as train seat availability prediction, flight fare prediction and automated seat selection. Today these advanced algorithms and the millions of data points we feed into them every day ensure that our users get better information for making buying decisions than any of our competitors,” he shared. Quite early in the career, ixigo decided to build a team of AI researchers, which is bearing fruits now. With the extensive in-house research, they can now predict seat confirmation, seat availability, flight fares, train delays and much more using millions of data points that they capture from apps. While they have never remained with a particular stack or database type or framework, they use a lot of open source tools from Google and Amazon apart from building their own data and AI platform to solve some of these problems at scale. “We are constantly working on improving hotel curation and ranking based on data science as well as on the user’s past searches, click-through or bookings. Through this, we can offer a much more personalised, curated list of hotels, flights and trains that will help the customer save a lot of time,” he said. As their focus now is to take deeper bets, big data is helping in making the entire research process more efficient and cost effective for the consumers. “Three years ago, research and travel bookings contributed to around 50-60% of our total bookings and now contribute to more than 80% of our total bookings. By using machine learning, we are able to predict a lot of travel related aspects for the user, making the booking experience hassle-free,” he said. Explaining an use case he said, for instance, the train PNR prediction feature on the app informs the user the probability of confirmation for their wait-listed ticket. “We also show flight fare prediction, which informs users whether it is the right time to book that flight or wait for another three days to get the same ticket for, say, Rs 1,000 cheaper,” he shared. TARA is a culmination of all the building blocks and technology they’ve built over the years. “Initially we launched ‘ixibaba’, a chatbot that works on textual queries and gives you answers related to travel searches. But we soon realised that because ixibaba was built using a rule-based system, it wasn’t able to handle the wide range of queries and it was not very scalable,” he shared. That’s when the team decided to take it to the next step and launch ‘TARA’, a personalised voice-based travel assistant that is 100% AI-driven. TARA is a 24×7 travel agent who gets the best travel deals from the website, books tickets and suggests places to see, based on user’s past visits and travel preferences. “The use of AI is what differentiates ‘TARA’ from a typical chatbot. Because it is powered by deep learning, TARA could learn on its own and hence scale. We took about six months to train it on customer service queries and other use cases in order to make TARA so functional, that customers can’t differentiate between talking to an AI-driven assistant and a human customer care executive. Now we are at a point where we have automated our customer support service to 70-80 percent,” shared Kumar. Kumar proudly shares that ixigo has currently become the fastest growing travel company in India, with nearly 21 mn predominantly mobile monthly active users and 90 mn downloads across apps. “The company has seen 6x growth in transactions touching 1 million passenger bookings per month through its platform for flights, hotels, buses and trains,” he said. “Our focus in the coming year is to drive faster growth in next billion users segment through growth in train, bus, budget hotel and first-time flyers segments by continuing to build innovative experiences for travellers in India. The next phase is mostly about leveraging data and AI to build a much more personalised and seamless experience for the Indian travellers going forward. Obviously, TARA is going to play a key role in creating that experience in local Indian languages,” he said on a concluding note.